Home » SD Connect C4 » Set of chips for unlock and change the serial number SD Connect C4. Chips for unlock and change the serial number SD Connect C4. The proposed set of chips, flashed the original dump, allowing you to unlock the multiplexerMercedes SD Connect C4, and change the serial number to a unique “clear / white”. The kit includes detailed step-by-step procedure. 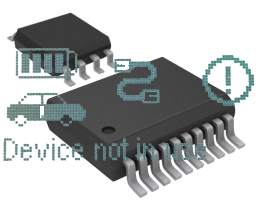 Read more about the block serial number and its significance in the operation of the multiplexer Mercedes Star Diagnosis C4 at the post Unlocking SD Connect. Change the serial number. Update. To complete the procedure, you must have any soldering station (hot air, infrared) and skills to solder SMD components. In a nutshell, the procedure consists of replacing the two chips with the subsequent firmware update (firmware) of the device through the utility ToolKit. The result is a multiplexer with “white” serial number that automatically provides a lifetime warranty against freezing and gives you the opportunity to work with any version software Mercedes Xentry DAS Vediamo. Guarantee from blocking involves not disclosing your serial number!